1) Taking Amelia on a walk in nearly 60 degree weather. After a brutal winter, it feels amazing to be outside. Amelia giggled almost the entire time. Husband - Are we doing anything tomorrow? Me - Not that I know of. Why, did you want to go to Costco or something? Husband - Uh, no. It's just our anniversary. Yep, that happened. Four years into marriage and I've already forgotten our anniversary. I've made some Asian lettuce wraps before that were pretty good, and some more that were really not so good. Too salty, too much sesame flavor, too . . . something. These wraps, though? Awesome. Just spicy enough, just enough peanut/sesame/ginger flavor, and so quick. Stirring all the ingredients together for the sauce is the most labor intensive part of the whole recipe, unless you count eating them without dropping any of the delicious filling out on your plate. They're also fairly light, which is always an added bonus when you are talking about a tasty recipe. Give these a try and add them to the favorite parts of your week. Make sauce by combining sesame oil, soy sauce, water, peanut butter, honey, rice vinegar, chili garlic sauce and pepper in a bowl. Heat a large, non-stick skillet on high. Add chicken, onion, salt and pepper, and cook until chicken is nearly done, stirring often to break up the meat. Add in minced garlic and ginger, and continue cooking until chicken is no longer pink. Microwave sauce for 20 seconds, then stir until smooth. Add to skillet and stir to combine. Add green onion and water chestnuts into the skillet, then cook for 1-2 minutes until the onions are soft and the water chestnuts are heated through. Season to taste with salt. Sprinkle with chopped peanuts, and serve with cold lettuce leaves. Those look delicious Nicole! 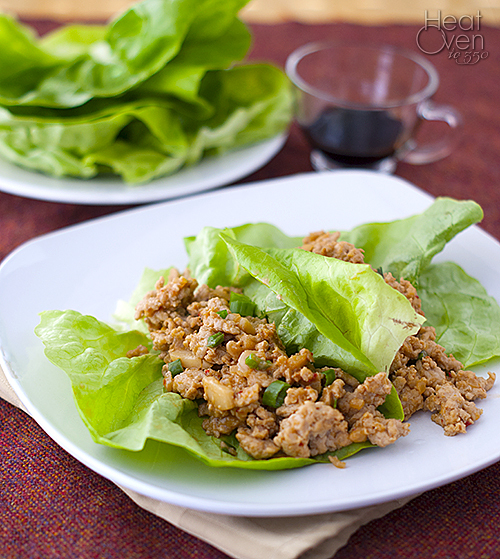 My daughter LOVES lettuce wraps, I'll have to send her this link. She's becoming quite a cook! Oh, that is seriously too funny, Happy Anniversary! 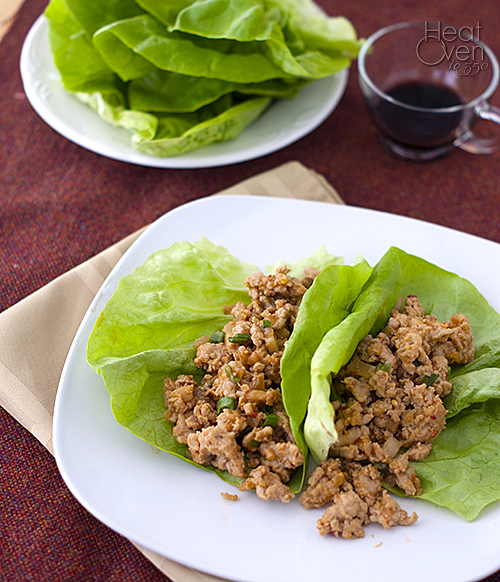 Ours is this month too :) We're trying like crazy to eat healthier and these lettuce wraps would be perfect! If you can believe it, I've never actually had them before. I will definitely have to give your version a try. I've never tried them at home, but love them at PF Changs. Oh my, you forgot your anniversary? lol Well, did husband have any plans then? haha 60 degrees? so jealous. Hasn't been above 40 in months! hahaha, aw, poor hubby. I'm sure you'll make it up to him by cooking him a delicious meal :) Love that this recipe has peanut butter in it. Sounds so good. I think I'll make it when Nate comes home...tuesday! This recipe is great! I first seen an almost identical version of it on Iowa Girl Eats site and made them. Love them!! Love these. I'm trying to cut carbs (rather unsuccessfully) and lettuce as a vehicle is a great idea.